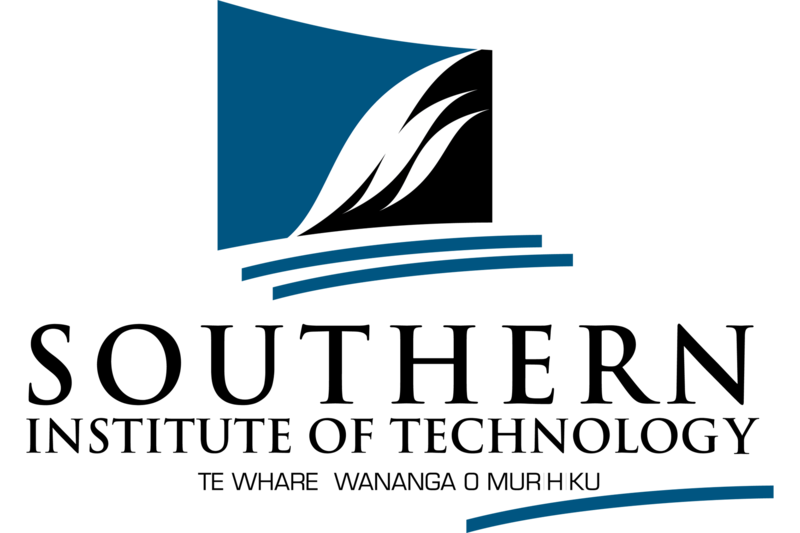 Click here to view all available newsletters. NB: SMCI Newsletter is now on quarterly publication (June, September,December, March). Please subscribe to our mailing system if you want to receive up to date information of SMCI. Future events, workshops, group meetings and activities will be directly forwarded to you via email or post. We would like to convey our heartfelt condolences to the families who have lost their beloved ones during the tragedy in Christchurch. We at SMC stand together as one to support those in this time of need. Kia Kaha Christchurch! The Multicultural Food Festival 2019 is just around the corner and its getting a lot busier at the office starting from the beginning of this year. The Food Festival is an annual event organised by the Southland Multicultural Council and this year it will be held on the 23rd of March 2019 at ILT Stadium from 10am to 6pm. The very first event we organised for 2019 was the Multicultural Marae Noho. It was a great experience for all the participants as it enabled them to gain further knowledge about Maori culture. Our heartiest gratitude to Doreen and Danette for the support they rendered by facilitating the workshop. We were also privileged to collaborate with the Brazilian community to organise Brazilian Day to celebrate their culture on the 23rd of February. It was a successful event full of fun and entertainment for the whole family. On behalf of SMC committee I would like to thank Joice for coordinating the event. really grateful to all our volunteers because the success of the events would not have been possible without them. Hope to see you all at the food festival and also during the upcoming events and wishing everyone success in everything you do! 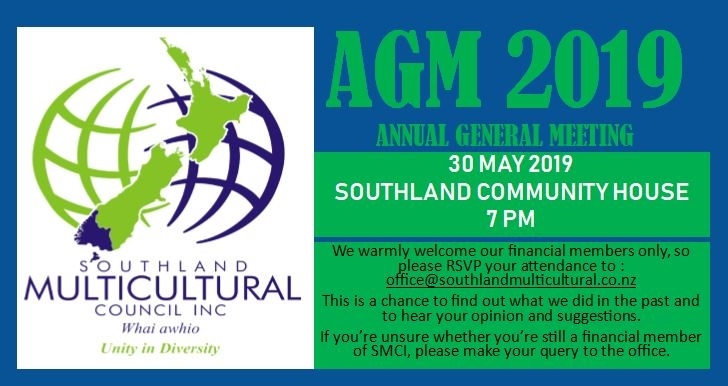 SMCI Annual General Meeting will be held on 30 May 2019, 7PM at the Southland Community House. If you're unsure whether you're still a financial member of SMCI, please make your query to the office now. “And suddenly you just know it’s time to start something new and trust the magic of new beginnings.” Walking into the year 2019 leaving the past behind, moving forward into new challenges and trials not knowing what to expect drove me to anxiety yet wonder. 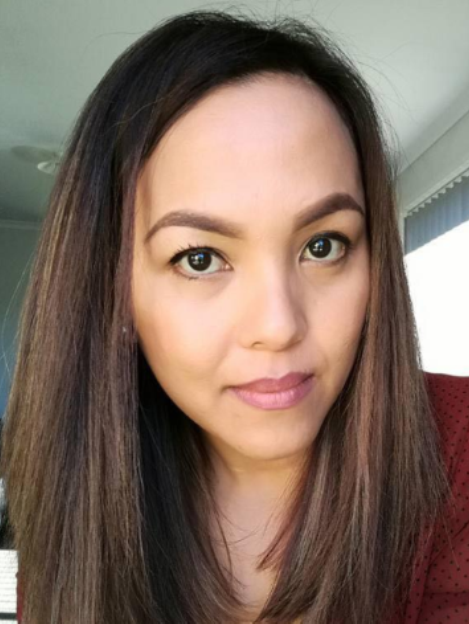 My adventure in Invercargill began a month ago and although I had the comfort of my family, loneliness and fear did somewhat succumb me as I felt like a lost fawn in a forest, all alone. But every cloud has its silver lining as I was acquainted with Meggy from Southland Multicultural Council which then led to a new start for me as a volunteer. I met Meggy a year ago during my visit in Invercargill and she was an embodiment of strength, positivity and courage. Being away from her homeland herself, she was able to understand my worries and yet make me feel like home. Coming from Malaysia, a country rich with heritage, diversity and culture, it has always been something I was passionate about thus being a part of SMC embraced me into the diversity of culture and communities. Being a volunteer in SMC is a truly engaging and rewarding experience. As an extrovert, I have always been up for challenges and new opportunities and it was certainly the perfect fit for me. 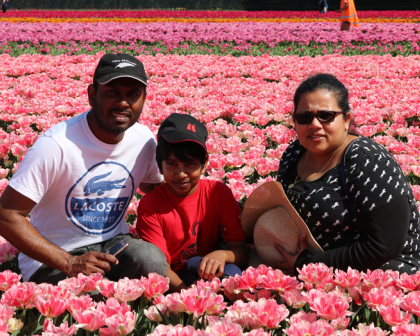 It enabled me to discover and learn more about the multicultural community here in NZ. SMC has organised a variety of events that reach out to the community to promote awareness as well as unity. Events as such are the drive that makes us feel whole despite diversity and being able to be a part of it is indeed wonderful. I am currently lending them a hand with the preparations for the Multicultural Food Festival and it has been a rewarding experience for me and I certainly look forward to it and the events that SMC is yet to offer for the year 2019. Coming to NZ has always been a childhood dream and with the support SMC has given me, I can hold on to the belief that I am not alone and dreams do become reality . Southland Multicultural Council Inc. is a member based organisation, affiliated to the New Zealand Federation of Multicultural Councils. Promoting and Celebrating the Cultural Diversity in our Community. Supporting and arranging Educational forums on the NZ way of life. Educate our Community by encouraging new migrants to speak to groups about their life in New Zealand. Assist with Settlement Issues through our office; social contacts; home visits; membership and invites to join Women's, Youth & Men's Group. To the Multicultural family and friends, especially to our Muslim community, there are absolutely no words to express how much sadness and sorrow we are all feeling right now. We are all shocked by the Christchurch tragedy. On behalf of the Southland Multicultural Council, we express our sincere sympathies and stand with you together in solidarity. The recent vigil at Wachner Place showed that our community does care and demonstrated how much strength we have as one. SMC is here to support to our Muslim community and indeed everyone who is in need irrespective of race or religion. ”-Our people, our cultures, our languages”-“O tātou iwi, ō tātou ahurea, ō tātou reo” through the Multicultural Food Festival and multicultural performances. It’s was a celebration to embrace cultural diversity within the Southland region. The event went very well and thanks to all the people who came along and participated the event. I woul like to encourage our community to be vigilant and be safe and always help each other whenever we can to have a peaceful community. Kindly share love, kindness please come and embrace the richness of our cultural diversity here in Southland. Lastly, we want to convey our condolences to all the families of the victims who faced this tragedy. Assallamu’alaikum Greetings to Multicultural Whanau and friends. 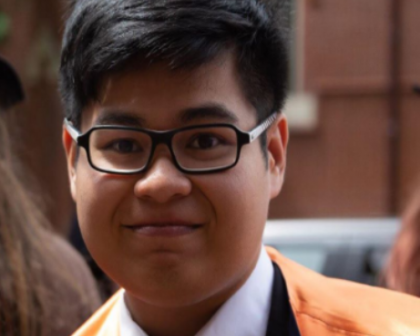 My name is Muhammad Celvin Raihan and I am the Southland Multicultural Council Men's’ Youth leader. I am from Indonesia; I became a committee member in March 2018. I attended the Indonesian/Vietnamese night potluck dinner in 2017. At that time, I was attending as a guest and I enjoyed every minute of my time there. With time, I had the interest to be a part of the organisation. The main reason was to experience working with various people from different backgrounds and ethnicity. As I spent more time as a volunteer, I requested to join in as one of the financial members. Fortunately, my request was agreed by the past committee members. Since then, I tried to volunteer in almost every event of SMC. Ashvin Illangeshwaran had to leave the organisation as he had been accepted in a company located in Hamilton. From August until November 2018, we had bowling nights which were held once a month. The aim of the activity was to have fun and to bring people from different nationalities to play together and build new friendships. The event was a success with a lot of positive feedback. This made me happy thus enhancing my motivation to organise new activities for the youth. Last February, there were two events: Multicultural Marae Noho and Brazilian Culture Night. In Marae Noho event we learned many things about Maori cultures. On the other hand, during Brazilian Culture Night it was a festive to enjoy the night in Brazilian style. There were Brazilian foods and some cultural performances. The general challenges that we faced to organise those events were mostly on choosing the right people to take responsibility for those events. I would like to say thank you to SMC Committee members and Meggy Bartlett-McBride for the wonderful opportunity that has been given to me.